Shield is a defensive ability in all six Super Smash Bros. games. In Super Smash Bros., it is used by pressing , and in Super Smash Bros. Melee, it is or . 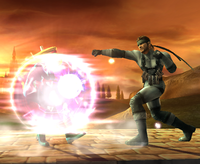 In Super Smash Bros. Brawl onward, the shield button changes based on the controller and can also be mapped to a different button. Upon pressing the shield button, a circle will appear (or an Egg in Yoshi's case) that will protect the player. The color of the shield depends on the player or team color, which is shown on the character select screen. CPUs will have a grey shield. If a player has the shield on for too long or it is broken by attacks or items, then the shield will break, causing the character to be stunned. They will not be able to move for a couple of seconds, allowing other players to attack them. A shield will also appear if the player continues holding the grab button after the grab has failed. In all six games, there is a way to "Roll" with a shield, by tilting the control stick right or left while in shield mode. Additionally, in Melee onward, players can perform sidestep dodges to avoid attacks. In Super Smash Bros. Melee only, players can control the strength of their shield, depending on how hard they press the or button. A thicker shield will erode slower from damage but faster from time, while a thinner shield will erode more from damage but significantly less from time duration, adding to shielding strategy. 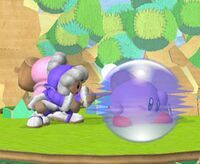 Also in all six games, if Jigglypuff's shield is broken, Jigglypuff will be sent into the air, potentially self-destructing. This page was last edited on March 13, 2019, at 16:17.